Lena Kennell, right, and her mom, Melody Ramsey, at their home in Newfield. 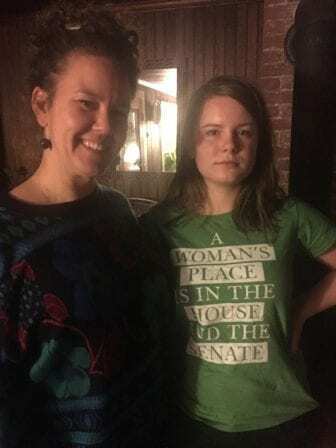 Lena Kennell, a sophomore at Newfield High School in Tompkins County, organized her school’s walkout with her friend, Caitlin Howell, senior. So, what’s next for students throughout the Southern Tier, after they organized walkouts to draw attention to the impacts of gun violence? Cuomo also urged State Education Commissioner Mary Ellen Elia to direct schools not to discipline students who walked out and to investigate reports of districts blocking school exits. “These young people are showing more leadership than the so-called leaders in Washington,” said Cuomo, in a letter to Elia. Urging Washington lawmakers to act was a big theme in Wednesday’s event. That’s according to students throughout the country associated with the group March for Our Lives. They’re planning a march on Washington D.C. later this month and many students in the Southern Tier plan to participate. Many students who walked out of their classrooms are calling on their representatives to do just that. At Newfield High School, Kennell and Howell encouraged other students to volunteer for campaigns, call their Congressperson, and offered to mail the letter for them. For Kennell, she thinks firearms are a good idea for self-defense, but doesn’t think people need semi-automatic weapons or bump stocks. However, she thinks the conversation needs to move beyond firearms to talk about mental health. 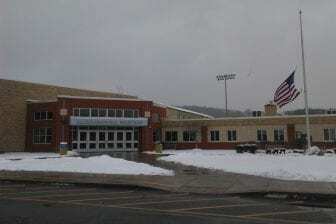 Maine-Enwell High School. Administrators told students they would be in violation of the school’s code of conduct if they walked out. However, the school held a few events focused on mental health and school safety. Tyler, a senior at Maine-Endwell High School, agrees with her. His school held a few events Wednesday focused on mental health and school safety. He grew up around guns and feels comfortable around them. He doesn’t think more restrictions on guns will make a difference. Mass shootings, he says, are a mental health issue. “Nobody goes out and kills that many people. Whether there’s gun laws or not, it’s a mental issue,” said Tyler. Other people, like Brenda Evans, want to see concrete steps. Her daughter is a freshman at Maine-Endwell with Tyler, but she didn’t even attend school on Wednesday. So, while a handful of students walked out and congregated in the school foyer, Evans stood outside the school. She’s concerned about her daughter’s safety. “Maine-Endwell is one of the better schools, but it can happen anywhere. There’s kids in class that she, you know, wonders about. We all have them,” said Evans. Metal detectors should be installed in every school, she said. Evans and these young people aren’t finished. “This is an issue that needs to be solved and we will not take ‘no’ for an answer,” said Kennell. Amidst their varying perspectives on school safety, it’s clear to them, they need see change.